MAZI project participated in the 2nd Fed4FIRE+ Engineering Conference with an exhibition booth, in Volos, Greece, in October 5th 2017. During the Demo Night current status and scientific outcomes of experiments conducted in Fed4FIRE+ testbeds were presented. 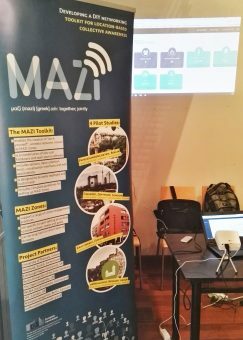 The MAZI booth demonstrated the research and experimentation conducted in NITOS testbed for the evaluation of the network performance of commercial network equipment (USB Wi-Fi Antennas). The incorporation of this knowledge into the development process of the MAZI toolkit facilitates the selection of the best possible solutions regarding the networking part of the MAZI toolkit. This entry was posted in Events, MAZI Toolkit, News. Bookmark the permalink.